The TOP 30 highest paid politicians in the world are all from Singapore:1. Elected President SR Nathan - S$3.9 million.2. Prime Minister Lee Hsien Loong - S$3.8 million.3. Minister Mentor Lee Kuan Yew - S$3.5 million.4. Senior Minister Goh Chok Thong - S$3.5 million.5. Senior Minister Prof Jayakumar - S$3.2 million.6. DPM & Home Affairs Minister Wong Kan Seng - S$2.9 million.7. DPM & Defence Minister Teo Chee Hean - $2.9 million8. Foreign Affairs Minister George Yeo - S$2.8 million.9. National Development Minister Mah Bow Tan - S$2.7 million.10. PMO Miniser Lim Boon Heng - S$2.7 million.11. Trade and Industry Minister Lim Hng Kiang - S$2.7 million.12. PMO Minister Lim Swee Say - S$2.6 million.13. Environment Minister & Muslim Affairs Minister Dr Yaccob Ibrahim - S$2.6 million.14. Health Minister Khaw Boon Wan - S$2.6 million.15. Finance Minister S Tharman - S$2.6 million.16. Education Minister & 2nd Minister for Defence Dr Ng Eng Hen - S$2.6 million.17. Community Development Youth and Sports Minister - Dr Vivian Balakrishnan - S$2.5 million.18. Transport Minister & 2nd Minister for Foreign Affairs Raymond Lim Siang Kiat - S$2.5 million.19. Law Minister & 2nd Minister for Home Affairs K Shanmugam - S$2.4 million.20. Manpower Minister Gan Kim Yong - S$2.2 million.21. 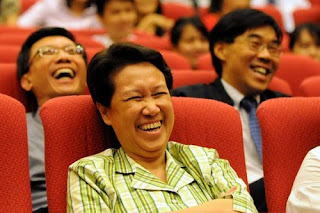 PMO Minister Lim Hwee Hwa - S$2.2 million.22. Acting ICA Minister - Lui Tuck Yew - S$2.0 million.